Reactions of oxidation of sulfide to sulfate and elemental sulfur. The electrons (e-) liberated from these oxidation reactions, which release chemical energy, are then used to fix carbon into organic molecules. The elements that become oxidized are shown in pink, those that become reduced in blue, and the electrons in purple. Microbial oxidation of sulfur is the oxidation of sulfur by microorganisms to produce energy. The oxidation of inorganic compounds is the strategy primarily used by chemolithotrophic microorganisms to obtain energy in order to build their structural components, survive, grow and reproduce. Some inorganic forms of reduced sulfur, mainly sulfide (H2S/HS−) and elemental sulfur (S0), can be oxidized by chemolithotrophic sulfur-oxidizing prokaryotes, usually coupled to the reduction of oxygen (O2) or nitrate (NO3−). Most of the sulfur oxidizers are autotrophs that can use reduced sulfur species as electron donors for carbon dioxide (CO2) fixation. The microbial oxidation of sulfur is an important link in the biogeochemical cycling of sulfur in environments hosting both abundant reduced sulfur species and low concentrations of oxygen, such as marine sediments, oxygen minimum zones (OMZs) and hydrothermal systems. The oxidation of hydrogen sulfide has been considered one of the most important processes in the environment, given that the oceans have had very low oxygen and high sulfidic conditions over most of the Earth's history. The modern analog ecosystems are deep marine basins such as those in the Black Sea, near the Cariaco trench and the Santa Barbara basin. Other zones of the ocean that experience periodic anoxic and sulfidic conditions are the upwelling zones off the coasts of Chile and Namibia, and hydrothermal vents, which are a key source of H2S to the ocean. Sulfur oxidizing microorganisms (SOM) are thus restricted to upper sediment layers in these environments, where oxygen and nitrate, which are electron acceptors with high redox potentials are available. The SOM may play an important yet unconsidered role in carbon sequestration, since some models and experiments with Gammaproteobacteria have suggested that sulfur-dependent carbon fixation in marine sediments could be responsible for almost half of total dark carbon fixation in the oceans. Besides, they may have been critical for the evolution of eukaryotic organisms, given that sulfur metabolism could have driven the formation of the symbiotic associations that sustained them (see below). Although the biological oxidation of reduced sulfur compounds competes with abiotic chemical reactions (e.g. the iron-mediated oxidation of sulfide to iron sulfide (FeS) or pyrite (FeS2)), thermodynamic and kinetic considerations suggest that biological oxidation far exceeds the chemical oxidation of sulfide in most environments. Experimental data from the anaerobic phototroph Chlorobaculum tepidum indicate that microorganisms enhance sulfide oxidation by three or more orders of magnitude. However, the general contribution of microorganisms to total sulfur oxidation in marine sediments is still unknown. The Alpha-, Gamma- and Epsilonproteobacterial SOM account for average cell abundances of 108 cells/m3 in organic-rich marine sediments. Considering that these organisms have a very narrow range of habitats, as explained below, a major fraction of sulfur oxidation in many marine sediments may be accounted for by these groups. Given that the maximal concentrations of oxygen, nitrate and sulfide are usually separated in depth profiles, many SOM cannot directly access their energy sources (reduced sulfur species) and electron acceptors at the same time. This limitation has led SOM to develop different morphological adaptations. The large sulfur bacteria (LSB) of the family Beggiatoaceae (Gammaproteobacteria) have been used as model organisms for benthic sulfur oxidation. They are known as 'gradient organisms', that are indicative of hypoxic (low oxygen) and sulfidic (rich in reduced sulfur species) conditions. They internally store large amounts of nitrate and elemental sulfur to overcome the spatial gap between oxygen and sulfide. Some of the Beggiatoaceae are filamentous and can thus glide between oxic/suboxic and sulfidic environments, while the non-motile ones rely on nutrient suspensions, fluxes, or attach themselves to bigger particles. Some marine non-motile LSB are the only known free-living bacteria that have two carbon fixation pathways: the Calvin-Benson cycle (used by plants and other photosynthetic organisms) and the reverse tricarboxylic acid cycle. Another evolutionary strategy of SOM is to partner up with motile eukaryotic organisms. The symbiotic SOM provides carbon and, in some cases, bioavailable nitrogen to the host, and gets enhanced access to resources and shelter in return. This lifestyle has evolved independently in sediment-dwelling ciliates, oligochaetes, nematodes, flatworms and bivalves. Recently, a new mechanism for sulfur oxidation was discovered in filamentous bacteria. It is called electrogenic sulfur oxidation (e-SOx), and involves the formation of multicellular bridges that connect the oxidation of sulfide in anoxic sediment layers with the reduction of oxygen or nitrate in oxic surface sediments, generating electric currents over centimeter distances. The so-called cable bacteria are widespread in shallow marine sediments, and are believed to conduct electrons through structures inside a common periplasm of the multicellular filament, a process that may influence the cycling of elements at aquatic sediment surfaces, for instance, by altering iron speciation. The LSB and cable bacteria seem to be restricted to undisturbed sediment with stable hydrodynamic conditions, while symbiotic SOM and their hosts have been mainly found in permeable coastal sediments. The oxidation of reduced sulfur compounds is performed exclusively by Bacteria and Archaea. All the Archaea involved in this process are aerobic and belong to the Order Sulfolobales, characterized by acidophiles (extremophiles that require low pHs to grow) and thermophiles (extremophiles that require high temperatures to grow). The most studied have been the genera Sulfolobus, an aerobic Archaea, and Acidianus, a facultative anaerobe (i.e. an organism that can obtain energy either by aerobic or anaerobic respiration). Sulfur oxidizing bacteria (SOB) are aerobic, anaerobic or facultative, and most of them are obligate or facultative autotrophs, that can either use carbon dioxide or organic compounds as a source of carbon (mixotrophs). The most abundant and studied SOB are in the family Thiobacilliaceae in terrestrial environments, and in the family Beggiatoaceae in aquatic environments . Aerobic sulfur oxidizing bacteria are mainly mesophilic, which grow at moderate ranges of temperature and pH, although some of them are thermophilic and/or acidophilic. Outside these families, other SOB described belong to the genera Acidithiobacillus, Aquaspirillum, Aquifex, Bacillus, Methylobacterium, Paracoccus, Pseudomonas  Starkeya, Thermithiobacillus, and Xanthobacter. On the other hand, the cable bacteria belong to the family Desulfobulbaceae of the Deltaproteobacteria and are currently represented by two candidate Genera, "Candidatus Electronema" and "Candidatus Electrothrix". Anaerobic SOB (AnSOB) are mainly neutrophilic/mesophilic photosynthetic autotrophs, which obtain energy from sunlight but use reduced sulfur compounds instead of water as electron donors for photosynthesis. AnSOB include some purple sulfur bacteria (Chromatiaceae) such as Allochromatium, and green sulfur bacteria (Chlorobiaceae), as well as the purple non-sulfur bacteria (Rhodospirillaceae) and some Cyanobacteria. The AnSOB Cyanobacteria are only able to oxidize sulfide to elemental sulfur and have been identified as Oscillatoria, Lyngbya, Aphanotece, Microcoleus, and Phormidium. Some AnSOB, such as the facultative anaerobes Thiobacillus spp., and Thermothrix sp., are chemolithoautotrophs, meaning that they obtain energy from the oxidation of reduced sulfur species, which is then used to fix CO2. Others, such as some filamentous gliding green bacteria (Chloroflexaceae), are mixotrophs. From all of the SOB, the only group that directly oxidize sulfide to sulfate in abundance of oxygen without accumulating elemental sulfur are the Thiobacilli. The other groups accumulate elemental sulfur, which they may oxidize to sulfate when sulfide is limited or depleted. Enzymatic pathways used by sulfide-oxidizing microorganisms. Left: SQR pathway. Right: Sox pathway. HS−: sulfide; S0: elemental sulfur; SO32-: sulfite; APS: adenosine-5'-phosphosulfate; SO42-: sulfate. Redrawn (adapted) with permission from Poser, A., Vogt, C., Knöller, K., Ahlheim, J., Weiss, H., Kleinsteuber, S., & Richnow, H. H. (2014). Stable sulfur and oxygen isotope fractionation of anoxic sulfide oxidation by two different enzymatic pathways. Environmental science & technology, 48(16), 9094–9102. Copyright 2008 American Chemical Society. 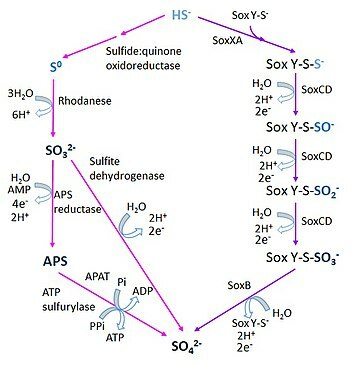 The sulfide:quinone oxidorreductase pathway (SQR), widespread in green sulfur bacteria, that involves the formation of intermediate compounds such as sulfite (SO32-) and adenosine 5'-phosphosulfate (APS), which are known to have a significant oxygen isotope exchange. The step catalyzed by SQR can also be mediated by a membrane-bound flavocytochrome c-sulfide dehydrogenase (FCSD). The Sox pathway, or Kelly-Friedrich pathway as established in the Alphaproteobacteria Paracoccus spp., mediated by the thiosulfate-oxidizing multi-enzyme (TOMES) complex, in which sulfide or elemental sulfur form a complex with the enzyme SoxY and remains bound to it until its final conversion to sulfate. The rDsr pathway, used by some microorganisms in the Chlorobi (green sulfur bacteria), Alpha, Beta and Gammaproteobacteria, in which sulfide is oxidized to sulfite by means of a reverse operation of the dissimilatory sulfite reduction (Dsr) pathway. The sulfite generated by rDsr is then oxidized to sulfate by other enzymes. The direct oxidation of sulfite to sulfate by a type of mononuclear molybdenum enzyme known as sulfite oxidoreductase. Three different groups of these enzymes are recognized (the xanthine oxidase, sulfite oxidase (SO) and dimethyl sulfoxide reductase families), and they are present in the three domains of life. The aforementioned Sox pathway, through which both sulfur atoms in thiosulfate are reduced to sulfate without the formation of any free intermediate. The oxidation of thiosulfate (S2O32-) via the formation of tetrathionate (S4O62-) intermediate, that is present in several obligate chemolithotrophic Gamma and Betaproteobacteria as well as in facultative chemolithotrophic Alphaproteobacteria. The branched thiosulfate oxidation pathway, a mechanism in which water-insoluble globules of intermediate sulfur are formed during the oxidation of thiosulfate and sulfide. It is present in all the anoxygenic photolithotrophic green and purple sulfur bacteria, and the free-living as well as symbiotic strains of certain sulfur-chemolithotrophic bacteria. In any of these pathways, oxygen is the preferred electron acceptor, but in oxygen-limited environments nitrate, oxidized forms of iron and even organic matter are used instead. Cyanobacteria normally perform oxygenic photosynthesis using water as electron donor. However, in the presence of sulfide, oxygenic photosynthesis is inhibited, and some cyanobacteria can perform anoxygenic photosynthesis by oxidation of sulfide to thiosulfate − using Photosystem I with sulfite− as a possible intermediate sulfur compound. Sulfide oxidation can proceed under aerobic or anaerobic conditions. Aerobic sulfide-oxidizing bacteria usually oxidize sulfide to sulfate and are obligate or facultative chemolithoautotrophs. The latter can grow as heterotrophs, obtaining carbon from organic sources, or as autotrophs, using sulfide as the electron donor (energy source) for CO2 fixation. The oxidation of sulfide can proceed aerobically by two different mechanisms: substrate-level phosphorylation, which is dependent on adenosine monophosphate (AMP), and oxidative phosphorylation independent of AMP, which has been detected in several Thiobacilli (T. denitrificans, T. thioparus, T. novellus and T. neapolitanus), as well as in Acidithiobacillus ferrooxidans. The archaeon Acidianus ambivalens appears to possess both an ADP-dependent and an ADP independent pathway for the oxidation of sulfide. Similarly, both mechanisms operate in the chemoautotroph Thiobacillus denitrificans, which can oxidize sulfide to sulfate anaerobically using nitrate as terminal electron acceptor  which is in turn reduced to dinitrogen (N2). Two other anaerobic strains that can perform a similar process were identified as similar to Thiomicrospira denitrificans and Arcobacter. Among the heterotrophic SOB are included species of Beggiatoa that can grow mixotrophically, using sulfide to obtain energy (autotrophic metabolism) or to eliminate metabolically formed hydrogen peroxide in the absence of catalase (heterotrophic metabolism). Other organisms, such as the Bacteria Sphaerotilus natans  and the yeast Alternaria  are able to oxidize sulfide to elemental sulfur by means of the rDsr pathway. Some Bacteria and Archaea can aerobically oxidize elemental sulfur to sulfuric acid. Acidithiobacillus ferrooxidans and Thiobacillus thioparus can oxidize sulfur to sulfide by means of an oxygenase enzyme, although it is thought that an oxidase could be used as well as an energy saving mechanism. For the anaerobic oxidation of elemental sulfur, it is thought that the Sox pathway plays an important role, although this is not yet completely understood. Thiobacillus denitrificans uses oxidized forms on nitrogen as terminal electron acceptor instead of oxygen, and A. ferrooxidans uses ferrous iron. Most of the chemosynthetic autotrophic bacteria that can oxidize elemental sulfur to sulfate are also able to oxidize thiosulfate to sulfate as a source of reducing power for carbon dioxide assimilation. However, the mechanisms that they utilize may vary, since some of them, such as the photosynthetic purple bacteria, transiently accumulate extracellular elemental sulfur during the oxidation of tetrathionate before oxidizing it to sulfate, while the green sulfur bacteria do not. A direct oxidation reaction (T. versutus ), as well as others that involve sulfite (T. denitrificans) and tetrathionate (A. ferrooxidans, A. thiooxidans and Acidiphilum acidophilum ) as intermediate compounds, have been proposed. Some mixotrophic bacteria only oxidize thiosulfate to tetrathionate. The mechanism of bacterial oxidation of tetrathionate is still unclear and may involve sulfur disproportionation, during which both sulfide and sulfate are produced from reduced sulfur species, and hydrolysis reactions. The fractionation of sulfur and oxygen isotopes during microbial sulfide oxidation (MSO) has been studied to assess its potential as a proxy to differentiate it from the abiotic oxidation of sulfur. The light isotopes of the elements that are most commonly found in organic molecules, such as 12C, 16O, 1H, 14N and 32S, form bonds that are broken more easily than bonds between the corresponding heavy isotopes, 13C, 18O, 2H, 15N and 34S . Because there is a lower energetic cost associated with the use of light isotopes, enzymatic processes usually discriminate against the heavy isotopes, and, as a consequence, biological fractionations of isotopes are expected between the reactants and the products. A normal kinetic isotope effect is that in which the products are depleted in the heavy isotope relative to the reactants (low heavy isotope to light isotope ratio), and although this is not always the case, the study of isotope fractionations between enzymatic processes may allow tracing the source of the product. The formation of sulfate in aerobic conditions entails the incorporation of four oxygen atoms from water, and when coupled with dissimilatory nitrate reduction (DNR) -the preferential reduction pathway under anoxic conditions- can have a contribution of oxygen atoms from nitrate as well. The δ18O value of the newly formed sulfate thus depends on the δ18O value of the water, the isotopic fractionation associated with the incorporation of oxygen atoms from water to sulfate and a potential exchange of oxygen atoms between sulfur and nitrogen intermediates and water. MSO has been found to produce small fractionations in 18O compared to water (~5‰). Given the very small fractionation of 18O that usually accompanies MSO, the relatively higher depletions in 18O of the sulfate produced by MSO coupled to DNR (-1.8 to -8.5 ‰) suggest a kinetic isotope effect in the incorporation of oxygen from water to sulfate and the role of nitrate as a potential alternative source of light oxygen. The fractionations of oxygen produced by sulfur disproportionation from elemental sulfur have been found to be higher, with reported values from 8 to 18.4‰, which suggests a kinetic isotope effect in the pathways involved in oxidation of elemental sulfur to sulfate, although more studies are necessary to determine what are the specific steps and conditions that favor this fractionation. The table below summarizes the reported fractionations of oxygen isotopes from MSO in different organisms and conditions. Aerobic MSO generates depletions in the 34S of sulfate, that have been found to be as small as −1.5‰ and as large as -18‰. For most microorganisms and oxidation conditions, only small fractionations accompany either the aerobic or anaerobic oxidation of sulfide, elemental sulfur, thiosulfate and sulfite to elemental sulfur or sulfate. The phototrophic oxidation of sulfide to thiosulfate under anoxic conditions also generates negligible fractionations. In the chemolithotrophs Thiobacillus denitrificans and Sulfurimonas denitrificans, MSO coupled to DNR has the effect of inducing the SQR and Sox pathways, respectively. In both cases, a small fractionation in the 34S of the sulfate, lower than -4.3‰, has been measured. Sulfate depletion in 34S from MSO could be used to trace sulfide oxidation processes in the environment, although it does not allow a discrimination between the SQR and Sox pathways. The depletion produced by MSO coupled to DNR is similar to up to -5‰ depletion estimated for the 34S in the sulfide produced from rDsr. In contrast, disproportionation under anaerobic conditions generates sulfate enriched in 34S up to 9‰ and ~34‰ from sulfide and elemental sulfur, respectively. Just as the fractionation of oxygen isotopes reveal, the larger fractionations in sulfate from the disproportionation of elemental sulfur point to a key step or pathway critical for inducing this large kinetic isotope effect. The table below summarizes the reported fractionations of sulfur isotopes from MSO in different organisms and conditions. ^ Fry B, Ruf W, Gest H, Hayes JM (1988). "Sulfur isotope effects associated with oxidation of sulfide by O2 in aqueous solution". Isotope Geoscience. 73 (3): 205–10. doi:10.1016/0168-9622(88)90001-2. PMID 11538336. ^ Burgin AJ, Hamilton SK (2008). "NO3−-Driven SO42− Production in Freshwater Ecosystems: Implications for N and S Cycling". Ecosystems. 11 (6): 908–922. doi:10.1007/s10021-008-9169-5. ^ a b c d e f g h i j Fike DA, Bradley AS, Leavitt WD (2016). Geomicrobiology of sulfur (Sixth ed.). Ehrlich's Geomicrobiology. ^ a b c Luther, George W.; Findlay, Alyssa J.; Macdonald, Daniel J.; Owings, Shannon M.; Hanson, Thomas E.; Beinart, Roxanne A.; Girguis, Peter R. (2011). "Thermodynamics and kinetics of sulfide oxidation by oxygen: a look at inorganically controlled reactions and biologically mediated processes in the environment". Frontiers in Microbiology. 2: 62. doi:10.3389/fmicb.2011.00062. ISSN 1664-302X. PMC 3153037. PMID 21833317. ^ Hawley, Alyse K.; Brewer, Heather M.; Norbeck, Angela D.; Paša-Tolić, Ljiljana; Hallam, Steven J. (2014-08-05). "Metaproteomics reveals differential modes of metabolic coupling among ubiquitous oxygen minimum zone microbes". Proceedings of the National Academy of Sciences. 111 (31): 11395–11400. doi:10.1073/pnas.1322132111. ISSN 0027-8424. PMC 4128106. PMID 25053816. ^ Middelburg, Jack J. (2011-12-23). "Chemoautotrophy in the ocean". Geophysical Research Letters. 38 (24): n/a. doi:10.1029/2011gl049725. ISSN 0094-8276. ^ Boschker, Henricus T. S.; Vasquez-Cardenas, Diana; Bolhuis, Henk; Moerdijk-Poortvliet, Tanja W. C.; Moodley, Leon (2014-07-08). "Chemoautotrophic Carbon Fixation Rates and Active Bacterial Communities in Intertidal Marine Sediments". PLOS ONE. 9 (7): e101443. doi:10.1371/journal.pone.0101443. ISSN 1932-6203. PMC 4086895. PMID 25003508. ^ Dyksma, Stefan; Bischof, Kerstin; Fuchs, Bernhard M; Hoffmann, Katy; Meier, Dimitri; Meyerdierks, Anke; Pjevac, Petra; Probandt, David; Richter, Michael (2016-02-12). "Ubiquitous Gammaproteobacteria dominate dark carbon fixation in coastal sediments". The ISME Journal. 10 (8): 1939–1953. doi:10.1038/ismej.2015.257. ISSN 1751-7362. PMC 4872838. PMID 26872043. ^ Overmann, Jörg; van Gemerden, Hans (2000). "Microbial interactions involving sulfur bacteria: implications for the ecology and evolution of bacterial communities". FEMS Microbiology Reviews. 24 (5): 591–599. doi:10.1111/j.1574-6976.2000.tb00560.x. ISSN 1574-6976. PMID 11077152. ^ Jørgensen, Bo Barker; Nelson, Douglas C. (2004). Sulfide oxidation in marine sediments: Geochemistry meets microbiology. In: Sulfur Biogeochemistry - Past and Present. Geological Society of America Special Paper 379. pp. 63–81. doi:10.1130/0-8137-2379-5.63. ISBN 978-0813723792. ^ Ravenschlag, Katrin; Sahm, Kerstin; Amann, Rudolf (2001-01-01). "Quantitative Molecular Analysis of the Microbial Community in Marine Arctic Sediments (Svalbard)". Applied and Environmental Microbiology. 67 (1): 387–395. doi:10.1128/AEM.67.1.387-395.2001. ISSN 0099-2240. PMC 92590. PMID 11133470. ^ a b c d Wasmund, Kenneth; Mußmann, Marc; Loy, Alexander (August 2017). "The life sulfuric: microbial ecology of sulfur cycling in marine sediments". Environmental Microbiology Reports. 9 (4): 323–344. doi:10.1111/1758-2229.12538. ISSN 1758-2229. PMC 5573963. PMID 28419734. ^ Winkel, Matthias; Salman-Carvalho, Verena; Woyke, Tanja; Richter, Michael; Schulz-Vogt, Heide N.; Flood, Beverly E.; Bailey, Jake V.; Mußmann, Marc (2016). "Single-cell Sequencing of Thiomargarita Reveals Genomic Flexibility for Adaptation to Dynamic Redox Conditions". Frontiers in Microbiology. 7: 964. doi:10.3389/fmicb.2016.00964. ISSN 1664-302X. PMC 4914600. PMID 27446006. ^ Dubilier, Nicole; Bergin, Claudia; Lott, Christian (2008). "Symbiotic diversity in marine animals: the art of harnessing chemosynthesis". Nature Reviews. Microbiology. 6 (10): 725–740. doi:10.1038/nrmicro1992. ISSN 1740-1534. PMID 18794911. ^ Risgaard-Petersen, Nils; Revil, André; Meister, Patrick; Nielsen, Lars Peter (2012). "Sulfur, iron-, and calcium cycling associated with natural electric currents running through marine sediment". Geochimica et Cosmochimica Acta. 92: 1–13. doi:10.1016/j.gca.2012.05.036. ISSN 0016-7037. ^ Nielsen, Lars Peter; Risgaard-Petersen, Nils; Fossing, Henrik; Christensen, Peter Bondo; Sayama, Mikio (2010). "Electric currents couple spatially separated biogeochemical processes in marine sediment". Nature. 463 (7284): 1071–1074. doi:10.1038/nature08790. ISSN 0028-0836. PMID 20182510. ^ Seitaj, Dorina; Schauer, Regina; Sulu-Gambari, Fatimah; Hidalgo-Martinez, Silvia; Malkin, Sairah Y.; Burdorf, Laurine D. W.; Slomp, Caroline P.; Meysman, Filip J. R. (2015-10-27). "Cable bacteria generate a firewall against euxinia in seasonally hypoxic basins". Proceedings of the National Academy of Sciences. 112 (43): 13278–13283. doi:10.1073/pnas.1510152112. ISSN 0027-8424. PMC 4629370. PMID 26446670. ^ Malkin, Sairah Y; Rao, Alexandra MF; Seitaj, Dorina; Vasquez-Cardenas, Diana; Zetsche, Eva-Maria; Hidalgo-Martinez, Silvia; Boschker, Henricus TS; Meysman, Filip JR (2014-03-27). "Natural occurrence of microbial sulphur oxidation by long-range electron transport in the seafloor". The ISME Journal. 8 (9): 1843–1854. doi:10.1038/ismej.2014.41. ISSN 1751-7362. PMC 4139731. PMID 24671086. ^ Fuchs T, Huber H, Burggraf S, Stetter KO (1996). "16S rDNA-based Phylogeny of the Archaeal Order Sulfolobales and Reclassification of Desulfurolobus ambivalens as Acidianus ambivalens comb. nov". Systematic and Applied Microbiology. 19 (1): 56–60. doi:10.1016/s0723-2020(96)80009-9. ISSN 0723-2020. ^ Stetter KO (2002). "Hyperthermophilic Microorganisms" (PDF). Astrobiology. Springer, Berlin, Heidelberg. pp. 169–184. doi:10.1007/978-3-642-59381-9_12. ISBN 9783642639579. ^ a b Kelly DP, Wood AP (March 2000). "Reclassification of some species of Thiobacillus to the newly designated genera Acidithiobacillus gen. nov., Halothiobacillus gen. nov. and Thermithiobacillus gen. nov". International Journal of Systematic and Evolutionary Microbiology. 50 Pt 2 (2): 511–16. doi:10.1099/00207713-50-2-511. PMID 10758854. ^ a b c Friedrich CG, Mitrenga G (1981). "Oxidation of thiosulfate by Paracoccus denitrificans and other hydrogen bacteria". FEMS Microbiology Letters. 10 (2): 209–212. doi:10.1111/j.1574-6968.1981.tb06239.x. ^ Huber R, Eder W (2006). The Prokaryotes. Springer, New York, NY. pp. 925–938. doi:10.1007/0-387-30747-8_39. ISBN 9780387254975. ^ Aragno M (1992). "The aerobic, chemolithoautotrophic, thermophilic bacteria". In Kristjansson JK (ed.). Thermophilic Bacteria. Boca Raton, Fla.: CRC Press. pp. 77–104. ^ Kelly DP, Smith NA (1990). Advances in Microbial Ecology. Advances in Microbial Ecology. Springer, Boston, MA. pp. 345–385. doi:10.1007/978-1-4684-7612-5_9. ISBN 9781468476149. ^ Kelly DP, McDonald IR, Wood AP (September 2000). "Proposal for the reclassification of Thiobacillus novellus as Starkeya novella gen. nov., comb. nov., in the alpha-subclass of the Proteobacteria". International Journal of Systematic and Evolutionary Microbiology. 50 Pt 5 (5): 1797–802. doi:10.1099/00207713-50-5-1797. PMID 11034489. ^ Trojan, Daniela; Schreiber, Lars; Bjerg, Jesper T.; Bøggild, Andreas; Yang, Tingting; Kjeldsen, Kasper U.; Schramm, Andreas (2016). "A taxonomic framework for cable bacteria and proposal of the candidate genera Electrothrix and Electronema". Systematic and Applied Microbiology. 39 (5): 297–306. doi:10.1016/j.syapm.2016.05.006. ISSN 0723-2020. PMC 4958695. PMID 27324572. ^ Imhoff JF, Süling J, Petri R (October 1998). "Phylogenetic relationships among the Chromatiaceae, their taxonomic reclassification and description of the new genera Allochromatium, Halochromatium, Isochromatium, Marichromatium, Thiococcus, Thiohalocapsa and Thermochromatium". International Journal of Systematic Bacteriology. 48 Pt 4 (4): 1129–43. doi:10.1099/00207713-48-4-1129. PMID 9828415. ^ Imhoff JF, Suling J, Petri R (1 October 1998). "Phylogenetic relationships among the Chromatiaceae, their taxonomic reclassification and description of the new genera Allochromatium, Halochromatium, Isochromatium, Marichromatium, Thiococcus, Thiohalocapsa and Thermochromatium". International Journal of Systematic Bacteriology. 48 (4): 1129–1143. doi:10.1099/00207713-48-4-1129. PMID 9828415. ^ Brune DC (July 1989). "Sulfur oxidation by phototrophic bacteria". Biochimica et Biophysica Acta. 975 (2): 189–221. doi:10.1016/S0005-2728(89)80251-8. PMID 2663079. ^ Cohen Y, Padan E, Shilo M (September 1975). "Facultative anoxygenic photosynthesis in the cyanobacterium Oscillatoria limnetica". Journal of Bacteriology. 123 (3): 855–61. PMC 235807. PMID 808537. ^ Garlick S, Oren A, Padan E (February 1977). "Occurrence of facultative anoxygenic photosynthesis among filamentous and unicellular cyanobacteria". Journal of Bacteriology. 129 (2): 623–29. PMC 234991. PMID 402355. ^ Beller HR, Chain PS, Letain TE, Chakicherla A, Larimer FW, Richardson PM, Coleman MA, Wood AP, Kelly DP (February 2006). "The genome sequence of the obligately chemolithoautotrophic, facultatively anaerobic bacterium Thiobacillus denitrificans". Journal of Bacteriology. 188 (4): 1473–88. doi:10.1128/JB.188.4.1473-1488.2006. PMC 1367237. PMID 16452431. ^ Turchyn AV, Brüchert V, Lyons TW, Engel GS, Balci N, Schrag DP, Brunner B (2010). "Kinetic oxygen isotope effects during dissimilatory sulfate reduction: A combined theoretical and experimental approach". Geochimica et Cosmochimica Acta. 74 (7): 2011–2024. doi:10.1016/j.gca.2010.01.004. ISSN 0016-7037. ^ Yamanaka, T.; Fukumori, Y.; Okunuki, K. (1979). "Preparation of subunits of flavocytochromes c derived from Chlorobium limicola f. thiosulfatophilum and Chromatium vinosum". Analytical Biochemistry. 95 (1): 209–213. doi:10.1016/0003-2697(79)90207-0. ISSN 0003-2697. PMID 227287. ^ Sievert SM, Scott KM, Klotz MG, Chain PS, Hauser LJ, Hemp J, Hügler M, Land M, Lapidus A, Larimer FW, Lucas S, Malfatti SA, Meyer F, Paulsen IT, Ren Q, Simon J (February 2008). "Genome of the epsilonproteobacterial chemolithoautotroph Sulfurimonas denitrificans". Applied and Environmental Microbiology. 74 (4): 1145–56. doi:10.1128/AEM.01844-07. PMC 2258580. PMID 18065616. ^ a b Kelly DP (1989). "Physiology and biochemistry of unicellular sulfur bacteria. Autotrophic Bacteria (Schlegel HG & Bowien B, (eds)". Springer-Verlag, Berlin Science Tech Publishers, Madison, WI. : 193–217. ^ a b c Friedrich CG, Rother D, Bardischewsky F, Quentmeier A, Fischer J (July 2001). "Oxidation of reduced inorganic sulfur compounds by bacteria: emergence of a common mechanism?". Applied and Environmental Microbiology. 67 (7): 2873–82. doi:10.1128/AEM.67.7.2873-2882.2001. PMC 92956. PMID 11425697. ^ Grimm F, Franz B, Dahl C (2008). "Thiosulfate and sulfur oxidation in purple sulfur bacteria.". In Friedrich C, Dahl C (eds.). Microbial Sulfur Metabolism. Berlin Heidelberg: Springer-Verlag GmbH. pp. 101–116. ^ Kappler, U.; Dahl, C. (2001-09-11). "Enzymology and molecular biology of prokaryotic sulfite oxidation". FEMS Microbiology Letters. 203 (1): 1–9. doi:10.1111/j.1574-6968.2001.tb10813.x. ISSN 0378-1097. PMID 11557133. ^ Ghosh, Wriddhiman; Dam, Bomba (2009). "Biochemistry and molecular biology of lithotrophic sulfur oxidation by taxonomically and ecologically diverse bacteria and archaea". FEMS Microbiology Reviews. 33 (6): 999–1043. doi:10.1111/j.1574-6976.2009.00187.x. ISSN 1574-6976. PMID 19645821. ^ Rivett MO, Buss SR, Morgan P, Smith JW, Bemment CD (October 2008). "Nitrate attenuation in groundwater: a review of biogeochemical controlling processes". Water Research. 42 (16): 4215–32. doi:10.1016/j.watres.2008.07.020. PMID 18721996. ^ Wit R, Gemerden H (1987). "Oxidation of sulfide to thiosulfate by Microcoleus chtonoplastes". FEMS Microbiology Letters. 45 (1): 7–13. doi:10.1111/j.1574-6968.1987.tb02332.x. ^ Rabenstein A, Rethmeier J, Fischer U (2014). "Sulphite as Intermediate Sulphur Compound in Anaerobic Sulphide Oxidation to Thiosulphate by Marine Cyanobacteria". Zeitschrift für Naturforschung C. 50 (11–12): 769–774. doi:10.1515/znc-1995-11-1206. ^ Wood P (1988). "Chemolithotrophy". In Anthony C (ed.). Bacterial Energy Transduction. London, UK: Academic Press. pp. 183–230. ^ Roy AB, Trudinger PA (1970). The biochemistry of inorganic compounds of sulphur. Cambridge University Press. ^ Zimmermann P, Laska S, Kletzin A (August 1999). "Two modes of sulfite oxidation in the extremely thermophilic and acidophilic archaeon acidianus ambivalens". Archives of Microbiology. 172 (2): 76–82. doi:10.1007/s002030050743. PMID 10415168. ^ Aminuddin M (November 1980). "Substrate level versus oxidative phosphorylation in the generation of ATP in Thiobacillus denitrificans". Archives of Microbiology. 128 (1): 19–25. doi:10.1007/BF00422300. PMID 7458535. ^ Aminuddin M, Nicholas DJ (1974). "Electron Transfer during Sulphide and Sulphite Oxidation in Thiobacillus denitrificans". Microbiology. 82 (1): 115–123. doi:10.1099/00221287-82-1-115. ^ Aminuddin M, Nicholas DJ (October 1973). "Sulphide oxidation linked to the reduction of nitrate and nitrite in Thiobacillus denitrificans". Biochimica et Biophysica Acta. 325 (1): 81–93. doi:10.1016/0005-2728(73)90153-9. PMID 4770733. ^ Gevertz D, Telang AJ, Voordouw G, Jenneman GE (June 2000). "Isolation and characterization of strains CVO and FWKO B, two novel nitrate-reducing, sulfide-oxidizing bacteria isolated from oil field brine". Applied and Environmental Microbiology. 66 (6): 2491–501. doi:10.1128/AEM.66.6.2491-2501.2000. PMC 110567. PMID 10831429. ^ Burton SD, Morita RY (December 1964). "Effect of Catalase and Cultural Conditions on Growth of Beggiatoa". Journal of Bacteriology. 88: 1755–61. PMC 277482. PMID 14240966. ^ Skerman VB, Dementjeva G, Carey BJ (April 1957). "Intracellular deposition of sulfur by Sphaerotilus natans". Journal of Bacteriology. 73 (4): 504–12. PMC 314609. PMID 13428683. ^ Skerman VB, Dementjev G, Skyring GW (April 1957). "Deposition of sulphur from hydrogen sulphide by bacteria and yeast". Nature. 179 (4562): 742. doi:10.1038/179742a0. PMID 13418779. ^ Belousova EV, Chernousova EI, Dubinina GA, Turova TP, Grabovich MI (2013). "[Detection and analysis of sulfur metabolism genes in Sphaerotilus natans subsp. sulfidivorans representatives]". Mikrobiologiia. 82 (5): 579–87. PMID 25509396. ^ Suzuki I, Silver M (July 1966). "The initial product and properties of the sulfur-oxidizing enzyme of thiobacilli". Biochimica et Biophysica Acta. 122 (1): 22–33. doi:10.1016/0926-6593(66)90088-9. PMID 5968172. ^ Brock TD, Gustafson J (October 1976). "Ferric iron reduction by sulfur- and iron-oxidizing bacteria". Applied and Environmental Microbiology. 32 (4): 567–71. PMC 170307. PMID 825043. ^ Lu W-P. (1986). "A periplasmic location for the bisulfiteoxidizing multienzyme system from Thiobacillus versutus". FEMS Microbiol Lett. 34 (3): 313–317. doi:10.1111/j.1574-6968.1986.tb01428.x. ^ Pronk, J (1990). "Oxidation of reduced inorganic sulphur compounds by acidophilic thiobacilli". FEMS Microbiology Letters. 75 (2–3): 293–306. doi:10.1016/0378-1097(90)90540-7. ISSN 0378-1097. ^ Knöller K, Vogt C, Feisthauer S, Weise SM, Weiss H, Richnow HH (November 2008). "Sulfur cycling and biodegradation in contaminated aquifers: insights from stable isotope investigations". Environmental Science & Technology. 42 (21): 7807–12. doi:10.1021/es800331p. PMID 19031864. ^ a b c d e Poser A, Vogt C, Knöller K, Ahlheim J, Weiss H, Kleinsteuber S, Richnow HH (August 2014). "Stable sulfur and oxygen isotope fractionation of anoxic sulfide oxidation by two different enzymatic pathways". Environmental Science & Technology. 48 (16): 9094–102. doi:10.1021/es404808r. PMID 25003498. ^ Taylor BE, Wheeler MC, Nordstrom DK (1984). "Stable isotope geochemistry of acid mine drainage: Experimental oxidation of pyrite". Geochimica et Cosmochimica Acta. 48 (12): 2669–2678. doi:10.1016/0016-7037(84)90315-6. ISSN 0016-7037. ^ a b Thurston RS, Mandernack KW, Shanks WC (2010). "Laboratory chalcopyrite oxidation by Acidithiobacillus ferrooxidans: Oxygen and sulfur isotope fractionation". Chemical Geology. 269 (3–4): 252–261. doi:10.1016/j.chemgeo.2009.10.001. ^ a b Hubert C, Voordouw G, Mayer B (2009). "Elucidating microbial processes in nitrate- and sulfate-reducing systems using sulfur and oxygen isotope ratios: The example of oil reservoir souring control". Geochimica et Cosmochimica Acta. 73 (13): 3864–3879. doi:10.1016/j.gca.2009.03.025. ^ a b Böttcher ME, Thamdrup B, Vennemann TW (2001). "Oxygen and sulfur isotope fractionation during anaerobic bacterial disproportionation of elemental sulfur". Geochimica et Cosmochimica Acta. 65 (10): 1601–1609. doi:10.1016/s0016-7037(00)00628-1. ^ a b Böttcher ME, Thamdrup B (2001). "Anaerobic sulfide oxidation and stable isotope fractionation associated with bacterial sulfur disproportionation in the presence of MnO2". Geochimica et Cosmochimica Acta. 65 (10): 1573–1581. doi:10.1016/s0016-7037(00)00622-0. ^ Brunner B, Bernasconi SM, Kleikemper J, Schroth MH (2005). "A model for oxygen and sulfur isotope fractionation in sulfate during bacterial sulfate reduction processes". Geochimica et Cosmochimica Acta. 69 (20): 4773–4785. doi:10.1016/j.gca.2005.04.017. ISSN 0016-7037. ^ Brunner B, Bernasconi SM (2005). "A revised isotope fractionation model for dissimilatory sulfate reduction in sulfate reducing bacteria". Geochimica et Cosmochimica Acta. 69 (20): 4759–4771. doi:10.1016/j.gca.2005.04.015. ISSN 0016-7037. ^ Toran L. (1986) Sulfate contamination in groundwater near an abandoned mine: Hydrogeochemical modeling, microbiology and isotope geochemistry. PhD. dissertation, Univ. of Wisconsin. ^ a b Kaplan IR, Rittenberg SC (1964). "Microbiological Fractionation of Sulphur Isotopes". Journal of General Microbiology. 34 (2): 195–212. doi:10.1099/00221287-34-2-195. PMID 14135528. ^ a b Kelly DP, Chambers LA, Rafter TA (1979). "Unpublished results. In: Microbiological fractionation of stable sulfur isotopes: a review and critique". Geomicrobiology Journal. 1 (3): 249–293. doi:10.1080/01490457909377735. ^ a b c Habicht KS, Canfield DE, Rethmeier J (1998). "Sulfur isotope fractionation during bacterial reduction and disproportionation of thiosulfate and sulfite". Geochimica et Cosmochimica Acta. 62 (15): 2585–2595. doi:10.1016/s0016-7037(98)00167-7. ^ a b Fry B, Gest H, Hayes J (1985). "Isotope effects associated with the anaerobic oxidation of sulfite and thiosulfate by the photosynthetic bacterium,Chromatium vinosum". FEMS Microbiology Letters. 27 (2): 227–232. doi:10.1111/j.1574-6968.1985.tb00672.x. ISSN 0378-1097. ^ Ivanov MV, Gogotova GI, Matrosov AG, Ziakun AM (1976). "[Fractionation of sulfur isotopes by phototrophic sulfur bacterium Ectothiorhodospira shaposhnikovii]". Mikrobiologiia. 45 (5): 757–62. PMID 1004261. ^ Fry B, Cox J, Gest H, Hayes JM (January 1986). "Discrimination between 34S and 32S during bacterial metabolism of inorganic sulfur compounds". Journal of Bacteriology. 165 (1): 328–30. doi:10.1128/jb.165.1.328-330.1986. PMC 214413. PMID 3941049. ^ Canfield DE, Thamdrup B, Fleischer S (1998). "Isotope fractionation and sulfur metabolism by pure and enrichment cultures of elemental sulfur-disproportionating bacteria". Limnology and Oceanography. 43 (2): 253–264. doi:10.4319/lo.1998.43.2.0253. This page was last edited on 18 February 2019, at 12:26 (UTC).